In 2016, I started a series called “100 Obscure Emotions.” I never intended on it becoming a book. I didn’t even believe I could complete the challenge of drawing for 100 days straight. But the magic of this experience was that I learnt to simply trust the process. So without any prior experience in illustration, I learnt to discipline myself to pick up my pen and just draw each day. As the project continued, I felt more confident in myself and I felt encouraged by how people were resonating with my images online. More than a challenge in drawing—it was a challenge in being vulnerable. I soon learnt that what is most personal is most universal. I also saw how honesty is always attractive. So the more honest I was in my drawings, the more inspired other people would be. I found that art could hold space for healing, and it could even translate the most obscure and intangible of emotions. After 100 days, I published my series of works into a book. This single side project changed a lot for me. My second side project was an off-shoot of this idea, however, now I draw other people’s emotions. It’s called “Dear Ruksi” and it’s similar to an advice column, except I don’t offer advice. I simply lend a listening ear, an empathetic heart and a drawing hand. In the last year, I’ve drawn over 70 illustrations based off of anonymous submissions of people who have anonymously shared their heart with me. It’s opened such a healing and empathetic space and I find it to be a unique combination of therapy and illustration. My third side project is what I’m currently working on and what I’m most excited about. I’m dedicating 100 days to exploring the Enneagram and translating it into a visual guide. 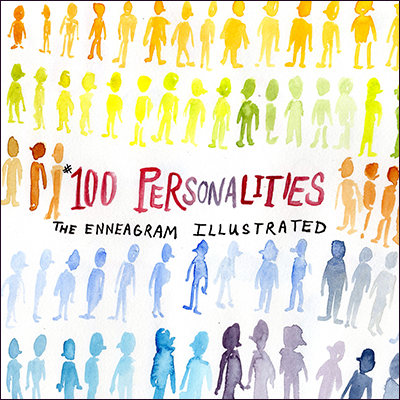 The Enneagram is a complex but incredibly nuanced and thorough system of understanding the human phyche. It’s an immensely powerful tool for understanding ourselves better. It’s become my personal goal to translate this system of knowledge into easily understandable and quickly drawn illustrations. I started doing my side projects almost accidentally. In 2015, I discovered something called “The 100 Day Project” and I decided to participate for the sake of “getting away from my computer.” Little did I know what a journey I would be on. I feel like I’ve re-discovered my passion for creativity through doing “The 100 Day Project” each year. This year will be my fourth time doing so! So yes, since 2015, I keep aside 100 days to do a marathon of a creative project. But the wonderful thing is that its sustainable because I do a little each day. One sketch a day and before I know—I have enough for a book. And there’s really nothing more satisfying than steady progress over time. For me, side projects have helped me to carve out and develop my identity as an artist. We all have a unique story to tell, but we won’t ever know what that is until we take time to simply create for the joy of creating. This can so easily be lost when we are always busy working for others. But the life-breath of an artist is to find their own voice and share it with others. 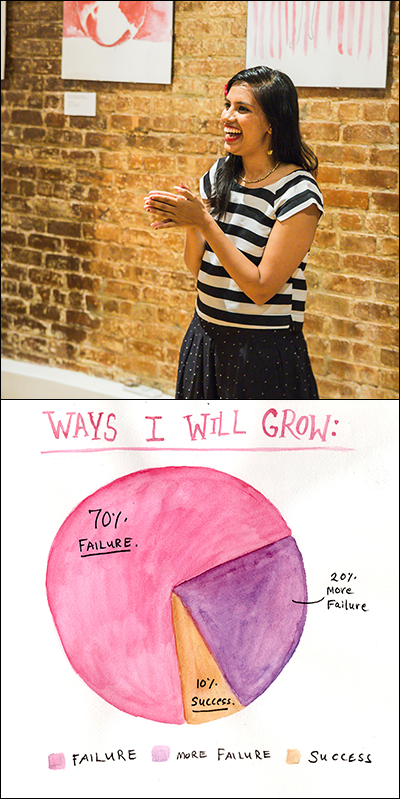 Diptych courtesy of Rukmini Poddar.